Poet Gwendolyn Brooks, the first black Pulitzer Prize winner, has died at the age of 83. Dr. Jifunza Wright, who became Brooks' attending physician recently, said the poet was diagnosed with cancer about a week ago and died Sunday at her home, surrounded by friends and family members who had been taking turns reading to her. Brooks had shunned physicians most of her life, associates said. As Illinois' poet laureate since 1968, Brooks had devoted much of her time to mentoring newer generations of poets. Brooks wrote more than 20 books and hundreds of poems, promoting an understanding of black culture while at the same time suggesting inclusiveness is the key to harmony. She continued to write throughout her life and this summer completed her most recent volume of poems, which are to be published by Third World Press, said Carolyn Aguila, Brooks' agent. "Her activity regarding her creative muse was very high," Aguila said. "She continued to speak and read and do all sorts of appearances." She was also known as a tireless teacher, promoter and advocate of creative writing in general and poetry in particular. "She mentored literally three generations of poets black, white, Hispanic, Native American," said longtime friend, poet and literature professor Haki Madhubuti. "She was all over the map sharing her gifts." Madhubuti founded the Gwendolyn Brooks Center for Creative Writing and Black Literature at Chicago State University. Brooks said a clearer dialogue between all people would create a better understanding of culture as a whole. "I believe that we should all know each other, we human carriers of so many pleasurable differences," she said in a recent interview. "To not know is to doubt, to shrink from, sidestep or destroy." Brooks won the Pulitzer Prize in 1950 for her second book of poetry, Annie Allen. She also received a lifetime achievement award from the National Endowment for the Arts in 1989 and was named the 1994 Jefferson Lecturer by the National Endowment for the Humanities, the highest honor bestowed by the federal government in the humanities. "The presence of Gwendolyn Brooks in the world was an inspiration to me when I was growing up and wanted to be a writer," said Quandra Prettyman, a teacher of African-American literature at Barnard College in New York. "That was the 40s and 50s. The amazing thing about Gwendolyn Brooks was that she continued to be that figure for black poets through the 60s, 70s, 80s and 90s, because she never stood still in her own work." Brooks was born in Topeka, Kan., but grew up in Chicago. She began her writing career at 11 when she mailed several poems to a community newspaper in Chicago to surprise her family. Her early works were mostly autobiographical, detailing the death of friends, her relationship with her family and their reaction to war and racism. After having a number of her poems published in Chicago's black newspapers, Brooks sent 19 poems to a list of publishers. "I said to myself, I'm going to go straight down that list until somebody takes these poems," she said. Harper & Bros., now HarperCollins, was at the top of the list. 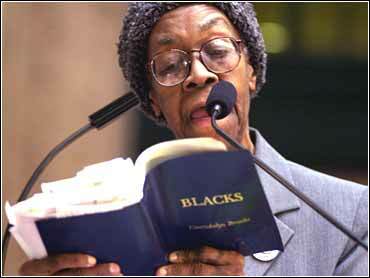 After suggesting she needed more poems, it published the collection in 1945 in a book called A Street in Bronzeville. Annie Allen followed four years later. "If you have one drop of blackness blood in you yes, of course it comes out red you are mine," she said. "You are a member of my family." She traveled to libraries, schools, hospitals, drug rehabilitation centers, prisons and universities reading her work and encouraging appreciation of the written word. Recognizing the difficulties in getting published, Brooks used her prestige as Illinois' poet laureate to encourage young writers. She established the Illinois Poet Laureate Awards in 1969 to motivate elementary and high school students to write. Winning entries, generally 10 elementary school students and 10 high school students, received cash prizes and a bound copy of selected poems. Brooks would attend poetry slams in Chicago, where dozens of aspiring poets would line up to read their works. She often would finance the award for the poet voted best by those in attendance. Brooks once said of the awards she received that only one meant a great deal to her. "In December 1967, at a workshop called the Kumuba Workshop in a rundown theater in Chicago, I was given an award for just being me and that's what poetry is to me -- just being me." She is survived by her daughter, Nora Brooks Blakely, and a son, Henry Blakely III; and a grandson. Her husband, poet and writer, Henry Blakely Jr., died in 1996, Aguila said. Funeral arrangements are pending.